યુનિવર્સિટી ઓફ ઑક્સફર્ડ (સામાન્ય રીતે ઑક્સફર્ડ વિશ્વવિદ્યાલય અથવા ફક્ત ઑક્સફર્ડ) એ ઈંગ્લેન્ડનાં શહેર ઑક્સફર્ડમાં આવેલું એક જગવિખ્યાત વિશ્વવિદ્યાલય છે, જે હાલમાં હયાત હોય તેવા સૌથી જુના વિશ્વવિદ્યાલયોમાં ત્રીજા ક્રમે આવે છે, અને અંગ્રેજી બોલતા દેશોમાં સૌથી જુનું છે.. જો કે તેની સ્થાપનાનો ચોક્કસ દિવસ કે વર્ષ જાણમાં નથી, પરંતુ ઓછામાં ઓછી ૧૧મી સદીથી તેમાં શિક્ષણકાર્ય ચાલી રહ્યું હોવાના પુરાવાઓ છે.આ વિશ્વવિદ્યાલયનો વિકાસ ૧૧૬૭ પછી ખૂબ ઝડપથી થયો, જ્યારે ઈંગ્લેન્ડનાં રાજા હેન્રી બીજાએ અંગ્રેજ વિદ્યાર્થીઓનાં પેરિસ વિશ્વવિદ્યાલયમાં ભનવા જવા પર પ્રતિબંધ લાધ્યો. નામનાં અંતે અભ્યાસ કે પદવી દર્શાવતા શબ્દો તરિકે હંમેશા Oxon. (કેટિન શબ્દ ઓક્સોનિયેન્સિસ પરથી) વપરાતું આવ્યું છે, જો કે Oxf પણ અમુક અધિકૃત પ્રકાશનોમાં વપરાયું છે. ૧૨૦૯માં વિશ્વવિદ્યાલયનાં વિદ્યાર્થીઓ અને ઑક્સફર્ડ શહેરનાં રહેવાસીઓ વચ્ચે થયેલા વિખવાદને કારણે અમુક શિક્ષકો ઇશાન તરફ આવેલા કેમ્બ્રિજ ભાગી ગયા, જ્યાં તેમણે નવા વિશ્વવિદ્યાલયની સ્થાપના કરી, જે આગળ જતાં કેમ્બ્રિજ વિશ્વવિદ્યાલય બન્યું. આ બંને પૌરાણિક વિશ્વવિદ્યાલયો વચ્ચે અનેક સામ્યો છે, અને સંયુક્ત રીતે તે ઑક્સબ્રિજ તરીકે ઓળખાય છે. આ બંને વિશ્વવિદ્યાલયોનાં બ્રિટિશ સંસ્કૃતિ અને ઇતિહાસ સાથેનાં લાંબા સમન્વયની સાથે સાથે, એક-બીજા વચ્ચેની પ્રતિસ્પર્ધા પણ એટલીજ ગાઢ છે. Most undergraduate teaching at Oxford is organised around weekly essay-based tutorials at self-governing colleges and halls, supported by lectures and laboratory classes organised by University faculties and departments. League tables consistently list Oxford as one of the UK's best universities, and Oxford consistently ranks in the world's top 10. The University is a member of the Russell Group of research-led British universities, the Coimbra Group, the League of European Research Universities, International Alliance of Research Universities and is also a core member of the Europaeum. For more than a century, it has served as the home of the Rhodes Scholarship, which brings students from a number of countries to study at Oxford as postgraduates or a second bachelor's degree. ઑક્સ્ફર્ડ વિશ્વવિધ્યાલયની સ્થાપનાની તારીખ હજી નક્કી નથી. ઑક્સ્ફર્ડમાં ભણતર ૧૯૦૬ની સાલથી યેનકેન પ્રકારે જીવંત હતુ. ૧૧૬૭માં પેરિસ યૂનિવર્સિટીમાંથી વિદેશીઓની હકાલપટ્ટીના કારણે ઘણા અંગ્રેજી વિદ્વાનોને ફ્રાન્સથી પરત ફરવાની અને ઑક્સ્ફર્ડમાં સ્થાયી થવાની ફરજ પડી. ૧૧૮૮માં ઇતિહાસકાર જેરાલ્ડ ઓફ વેલ્સ સ્નાતકોને વ્યાખ્યાન આપતાં, સૌ પ્રથમ વિખ્યાત વિદેશી વિદ્વાન ઍમો ઓફ ફ્રાઇસલેન્ડનું આગમન ૧૧૯૦માં થયાની નોંધ છે. The head of the University was named a chancellor from 1201, and the masters were recognised as a universitas or corporation in 1231. The students associated together, on the basis of geographical origins, into two “nations”, representing the North (including the Scots) and the South (including the Irish and the Welsh). In later centuries, geographical origins continued to influence many students' affiliations when membership of a college or hall became customary in Oxford. Members of many religious orders, including Dominicans, Franciscans, Carmelites, and Augustinians, settled in Oxford in the mid-13th century, gained influence, and maintained houses for students. At about the same time, private benefactors established colleges to serve as self-contained scholarly communities. Among the earliest were William of Durham, who in 1249 endowed University College, and John I de Balliol, father of the future King of Scots: Balliol College bears his name. Another founder, Walter de Merton, a chancellor of England and afterwards Bishop of Rochester, devised a series of regulations for college life; Merton College thereby became the model for such establishments at Oxford as well as at the University of Cambridge. Thereafter, an increasing number of students forsook living in halls and religious houses in favour of living at colleges. 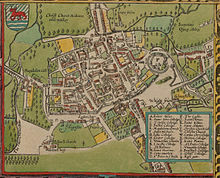 The new learning of the Renaissance greatly influenced Oxford from the late 15th century onward. Among University scholars of the period were William Grocyn, who contributed to the revival of the Greek language, and John Colet, the noted biblical scholar. With the Reformation and the breaking of ties with the Roman Catholic Church, Catholic Recusant scholars from Oxford fled to continental Europe, settling especially at the university of Douai. The method of teaching at the university was transformed from the medieval Scholastic method to Renaissance education, although institutions associated with the university suffered loss of land and revenues. In 1636, Chancellor William Laud, archbishop of Canterbury, codified the university statutes; these to a large extent remained the university's governing regulations until the mid-19th century. Laud was also responsible for the granting of a charter securing privileges for Oxford University Press, and he made significant contributions to the Bodleian Library, the main library of the university. The mid nineteenth century saw the impact of the Oxford Movement (1833–1845), led among others by the future Cardinal Newman. The influence of the reformed model of German university reached Oxford via key scholars such as Benjamin Jowett and Max Müller. ↑ "A Brief History of the University". University of Oxford. Retrieved 2007-10-30. ↑ "Campaign for Oxford". Retrieved 2010-01-05. ↑ ૩.૦ ૩.૧ ૩.૨ "Facts and Figures". University of Oxford. Retrieved 30 April 2010. ↑ ૪.૦ ૪.૧ "Student Statistics". University of Oxford. Retrieved 2010-04-30. ↑ ૬.૦ ૬.૧ ૬.૨ "A brief history of the University - University of Oxford". www.ox.ac.uk. Retrieved 2009-07-15. ↑ જેની જાણ હોય તેવા પ્રથમ શિક્ષક છે થીબોડ ડિ'એટેમ્પ્સ, જે ઓછામાં ઓછા ૧૧૧૬ પહેલા અહીં નહોતા, કેમકે તેઓ ૧૧૧૪ સુધી ફ્રાન્સમાં હતા: Gineste, B., "Thibaud d'Étampes", in Cahiers d'Étampes-Histoire 10 (2009), pp. 43-58. ↑ "The Times Good University Guide 2010". The Times. London. Retrieved 2009-09-24. ↑ "The Guardian University guide 2010". The Guardian. London. 2009-05-12. Retrieved 2009-09-24. ↑ "Top 500 World Universities (1-100)". ARWU 2009. Retrieved 2009-11-14. ↑ "World University Rankings". The Times Higher Education Supplement. Retrieved 2009-11-14. ↑ "Applying for the Rhodes Scholarships - The Rhodes Trust". rhodeshouse.ox.ac.uk. Retrieved 25 July 2010. ↑ 1965. - Handbook to the University of Oxford. - University of Oxford. - p.43. ↑ "Famous Oxonians". University of Oxford. 30 October 2007. Retrieved 13 June 2014. આ પાનાંમાં છેલ્લો ફેરફાર ૧૭ નવેમ્બર ૨૦૧૮ના રોજ ૧૭:૪૧ વાગ્યે થયો.